Studies suggesting artery function benefits after olive oil consumption have measured ischemia-induced, as opposed to flow-mediated, dilation, and there is just not good evidence that that is actually an index of endothelial function, which is what predicts heart disease. What about extra-virgin olive oil? This retains a fraction of the anti-inflammatory phytonutrients found in the olive fruit and doesn’t appear to induce the spike in inflammatory markers caused by regular olive oil. It may have more of a neutral effect, compared to butter, which exerted a noxious effect that lasted for up to six hours. In the largest prospective study ever to assess the relationship between olive oil consumption and cardiac events (like heart attacks), there was a suggestion that virgin olive oil may be better than regular olive oil, but neither was found to significantly reduce heart attack rates after controlling for healthy dietary behaviors, like vegetable intake, which tends to go hand-in-hand with olive oil intake in Mediterranean diet studies. Some studies, though, have shown that even extra-virgin olive oil may impair endothelial function. Why then do some studies suggest people’s endothelial function improves on a Mediterranean diet, which is rich in olive oil? Perhaps because that diet is also rich in whole grains, fruits, vegetables, beans, and walnuts. Dietary fruits and vegetables seem to provide some protection against the direct impairment of endothelial function produced by high-fat foods, including olive oil. Thus, health improvements may be in spite of, rather than because of, the oil. Simply adding some vegetables to a fatty meal may partially restore arterial functioning and blood flow. We can think of extra-virgin olive oil a little like fruit juice: It has nutrients, but the calories are relatively empty compared to those from the whole fruit. (Olives are, after all, fruits.) Freshly squeezed olive juice already has less nutrition than the whole fruit, but then olive oil producers also throw away the olive wastewater, which contains the water-soluble nutrients. As a result, we end up getting just a small fraction of the nutrition of the whole fruit by the time extra-virgin olive oil is bottled. 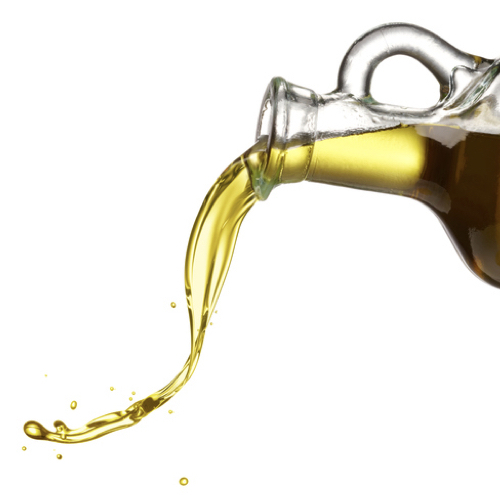 Refined olive oil (non-virgin) is even worse and, along with other vegetable oils, offers scant nutrition for their heavy caloric loads. Image Credit: Okea / Thinkstock. This image has been modified.